Every summer we look forward to the annual week-long visit of our two oldest grand kids, Joshua and Jordann. We pack as many activities into that week as we can. I planned to teach both kids how to play chess (to be described in a later post) and I selected a construction project for Joshua and grandmothermath did the same for Jordann. On the second morning of their visit we drove over to Hobby Lobby and purchased craft kits to work on in the hours between other activities, like going to a movie or watching old Abbot and Costello movies at home. Joshua picked out an inexpensive ($20) Robotic Arm kit. And I selected a working model of Leonardo da Vinci's design concept for a helicopter. We sat together at a table and each worked on our own project. Both kits contain high-quality wood structural components that are finished to the point of requiring little or no sanding. Even a tube of white glue is included in the kit. The only item not included in the kit is a metric ruler needed to identify the lengths of wood dowels. Here is a video of Joshua's completed project. He did all of the work himself and you can imagine his satisfaction when the arm worked as described, the first time! The three-axis arm is actuated using water-filled syringes and therefore models a hydraulic-operated system. Here is a picture of the completed helicopter kit. 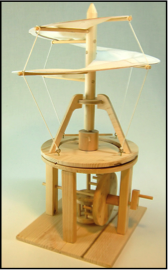 Turning the crank rotates the 'aerial screw' and again, it's a wonderful and easy-to-build working model. Both kits are marketed by the same company and can be purchased at Hobby Lobby stores or online. Here's the link to the pathfinders web site. We will be purchasing and building many of the other pathfinder kits. Once Joshua returned home he showed the robot arm to friends. In the following video his friend Mitchell is operating the arm to deliver a spoonful of ice cream to Joshua.